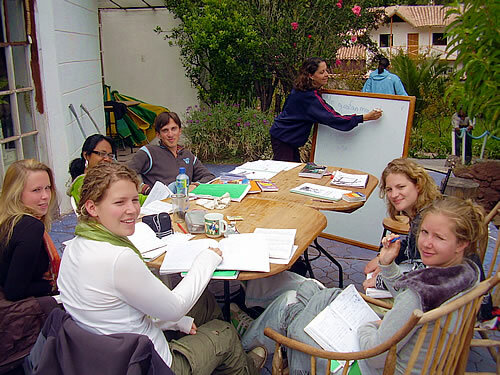 Amauta Spanish School in Peru and Argentina offers the unique opportunity to study and learn Spanish while immersed in the Peruvian or Argentine culture. Our experienced Spanish teachers emphasize an interactive way to learn Spanish; a proven methodology for foreign language learning. Our Spanish schools in Cusco, Peru and Buenos Aires (Argentina) are conveniently located in the city centers of two very popular destinations in South America. Cusco is the former capital of the legendary Inca Empire in Peru, now a charming small town in the Andes, full of culture, adventure, colorful local people and travelers with great options to speak Spanish to the locals and for being a volunteer in Peru. Buenos Aires is the cosmopolitan capital of Argentina, full of culture and activities; a stunning destination for a Spanish immersion program abroad. From Spanish group classes to individual or specialized Spanish lessons; from learning Spanish in the Peruvian rainforest to the Sacred Valley of the Incas: AMAUTA Spanish School offers you the flexibility to study Spanish how and where you want while making new friends and explore the country and the Culture. With 20 years of experience, AMAUTA understands that learning a new language is much more than sitting in a classroom. Therefore, we have worked hard to offer you a plethora of choices to allow you to learn to speak Spanish quickly while making the most of our time in Peru and Argentina. AMAUTA Spanish School offers a range of FREE daily cultural activities; from salsa to tango lessons, from music to cooking or ceramic workshops. And our teachers also organize you class outings to hidden gems of Cusco and Buenos Aires. All of this makes AMAUTA a distinctive Spanish School in South America..
AMAUTA's accommodations - family homestay or student residence -, and our volunteer projects in Peru and Argentina, internship opportunities, allow you to become part of the local communities. This is, without a doubt, the best way to learn how to speak Spanish quickly and increase your skills. Are you ready now to meet our AMAUTA team, to read about our Spanish courses and destinations, or to register? We also invite you to read our Student Reviews. If you are looking for a unique Spanish immersion program in Peru or Argentina, AMAUTA offers you an amazing and fulfilling experience! Our Spanish language school in Peru is located in stunning Cusco, the former capital of the legendary Inca Empire, close to the world famous lost city of the Incas, Machu Picchu. Our Spanish programs in Peru run in three locations: start with your Spanish lessons in the city of Cusco, and continue in the Spanish in Sacred Valley of the Incas or in the Amazon rainforest of Tambopata. We also offer a Spanish Program at our partnerschool in the capital Lima. We offer a wide variety of Spanish Courses ranging from our most basic 20 hours per week of group or individual classes to our specialty courses, such as Medical Spanish, Spanish and Volunteer, Spanish and TEFL, and many other interesting options! Our cultural courses have a diverse and interactive teaching style and include field trips to museums, art galleries, parks and other historical places of interest, such as the Recoleta Cemetery and the famous Caminito in La Boca. We work with four levels. The objectives of each are based on our experience and in accordance with the curriculum of the Instituto Cervantes and the equivalents of the Council of Europe. The levels beginners, intermediate, advanced and superior, and each of these has it´s own sub-levels. The AMAUTA Volunteer Work Program provides the unique opportunity to live and work in Peru and Argentina. Students will experience first-hand the rich cultural diversity while cultivating your Spanish proficiency. Through the Volunteer Program, AMAUTA and the volunteers are able to make contributions to Latin American society and to help those less fortunate. Volunteering can be a very rewarding experience when you see your work and support really making a difference. At AMAUTA SPANISH SCHOOL we don’t only organize Spanish classes at our schools. Come and visit our sections "Spanish Grammar", " Spanish words", "Spanish Phrases" and "Spanish Games", full of excersises with Spanish verbs and vocabulary to study and improve your Spanish. Study Spanish Online and practise in your own pace with our different excercises. Also visit our section Multilingual Spanish Survival Dictionary which you will find very helpful. Prepare yourself for your Spanish classes at our schools in Peru and Argentina and get the most out of your Spanish lessons. Learn about the Latin culture: Find out information about the culture of South America and Hispanic countries, such as Cinema, Literature, Music, Biography, Recipes.